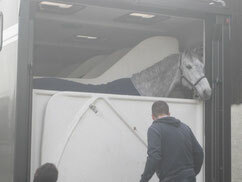 We are very excited to start our expedition to Spain to compete in the Sunshine Tour in Vejer de la Frontera for 5 consecutive weeks, where the weather and conditions should be perfect for show jumping at this time of the year. 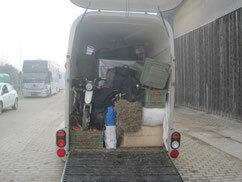 The six horses are on the lorry, and so is the equipment and food. The six horses we take on the 2,200 km drive to the South of Spain are Esqydo, Guidarc, Zondela, Deejee, Cilina and Jadore. 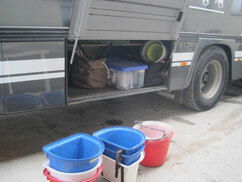 We hope they will not get totally bored during the long hours on the lorry and will all arrive safely at their destination. A huge thank-you to our drivers Conny and Beat, who will make sure that we advance at a good speed and reach our first stop in Oliva Nova within the next 15 hours maximum, where we will give the horses (and team) some time to relax and move their limbs before taking on the 2nd leg of the long drive into the sunshine. 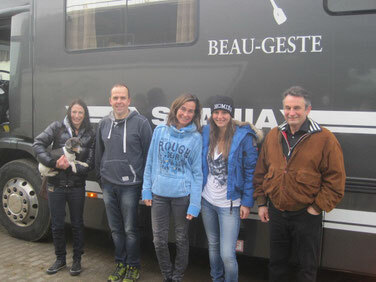 Our rider Larissa and her groom Kris, and Beat's daughter Olivia, complete the team on the lorry, and Larissa's dog Tiger supervises (or maybe sleeps through) the trip. 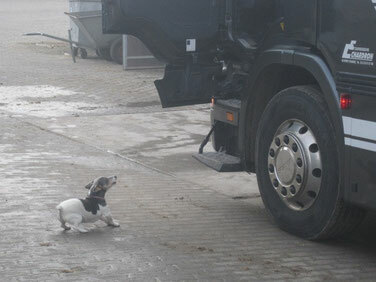 Lola wanted to go too, but then realized that Jürg will stay behind for the first two weeks to take care of her. Finally we can leave the cold and foggy weather and look forward to having fun, winning some ribbons, gaining experience and making progress with the horses and get them ready for the 2015 season under perfect conditions. And above all: Stay healthy and get back in one piece! Larissa will keep us posted on the Stall Notz Facebook page whenever she finds time (and a working internet connection), so please like our page to stay up-to-date! Hi there! Do you know if they make any plugins to assist with SEO? I'm trying to get my blog to rank for some targeted keywords but I'm not seeing very good results. If you know of any please share. Kudos! you're in point of fact a excellent webmaster. The site loading velocity is incredible. It kind of feels that you are doing any unique trick. Moreover, The contents are masterpiece. you've done a fantastic job in this subject! Hi there, this weekend is nice designed for me, as this moment i am reading this wonderful informative post here at my house.